Last week we gave you a primer on what was sure to be the wedding of the century summer. 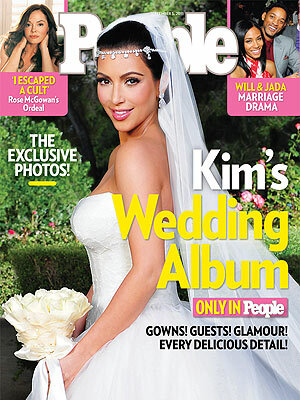 That’s right, Kris Humphries is now officially Kris Kardashian, and we promise to stop blogging about this wedding…someday. All jokes aside though, the new Mr. Kim and his bride pulled out all the stops to throw an all-out, glam, Austrian crystallized wedding. But the sparkle was certainly not limited to the enormous homage to Swarovski and Jesus that hung upon the altar. 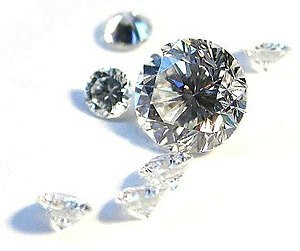 All eyes, presumably shaded to protect from blinding by bling, were on the bride’s diamonds. First up, The Ring. It’s been blogged about. It got a People spread. 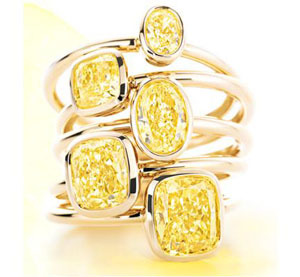 It has convinced this jewelry reporter to give emerald cut diamonds, like peace, a chance. And, as is the norm for any wedding (right? 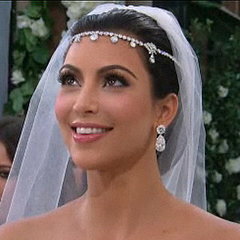 ), It sparked envious stares and minor neck strain in Kim’s unengaged guests as It made Its way down the aisle. That’s $2 million worth of carbon right there – deeply discounted in exchange for the global exposure designer Lorraine Schwartz is now enjoying. And, natch, you can’t have a ridiculously huge engagement ring without a coordinating wedding band. 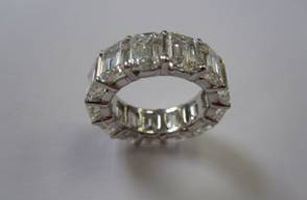 So Schwartz crafted this stunning platinum eternity band with more emerald cut diamonds, an estimated 15 carats worth. To get the proper impression of the bridal set, here they are worn together as K2 departs for their honeymoon. No one ever accused Kim of aiming for subtlety. As a tribute to Audrey Hepburn (not Princess Jasmine, contrary to popular belief among anyone born in the late eighties), Schwartz created this 65 carat headpiece studded with diamonds and dripping with – you guessed it- diamonds. Love it or hate it? The look is luxe, but definitely polarizing. 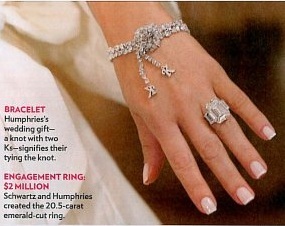 Kris’s wedding gift to Kim was this knotted diamond bracelet. Get it? Because they tied the KNOT! And both their knames start with K! Last but not least, Kim attributed her final “something borrowed” again to Lorraine Schwartz, who is quickly surpassing Jacob the Jeweler for star street cred master. These heart-stopping drop earrings are 28 carats of pure loveliness. Now these we can get onboard with. 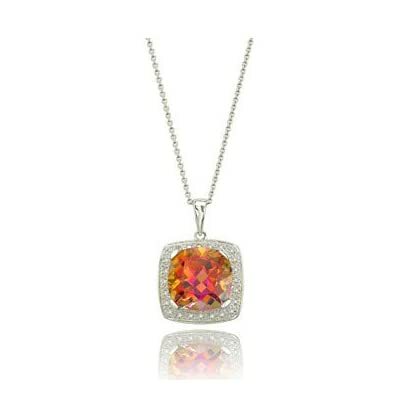 Liz for Raymond Lee Jewelers, your trusted source for wedding jewelry and luxury watches.